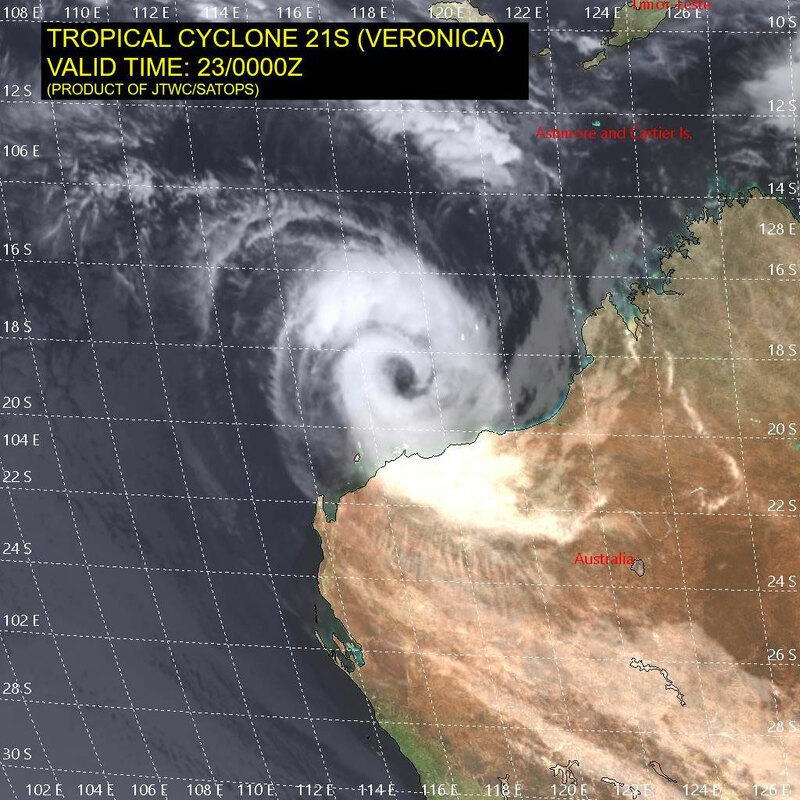 Tropical Cyclone veronica formed 20 March 2019 and developed to category 2 level off the Northern Western Australian coast (Pilbara region). 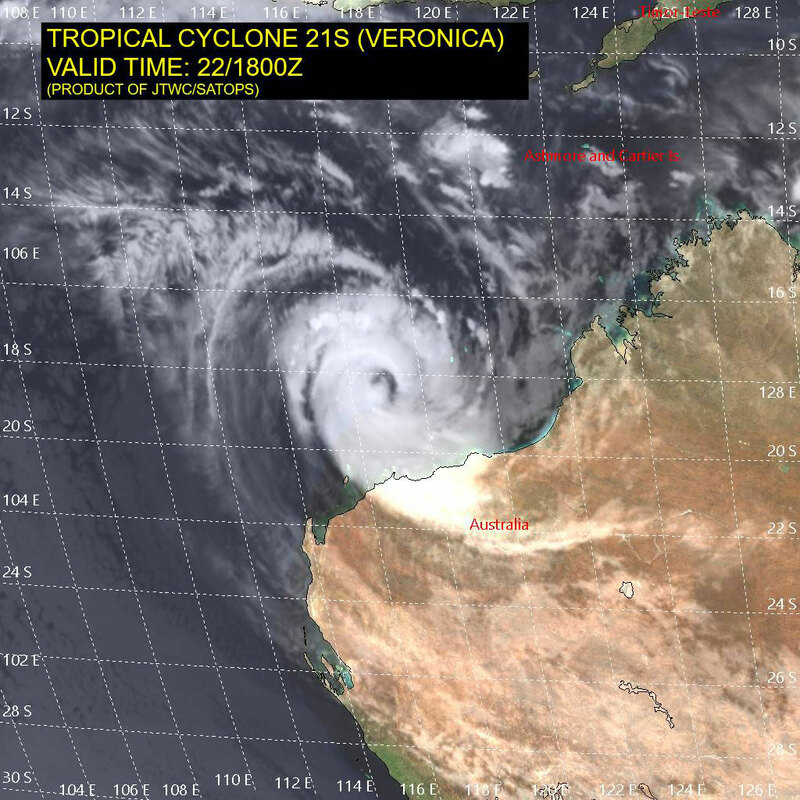 Veronica moved South West before turning towards the WA coast and developing into a category 4 Severe Tropical Cyclone. Severe Tropical Cyclone Veronica traveled very close to the WA coast near Port Hedland as a category 3 cyclone on Sunday 24 March. 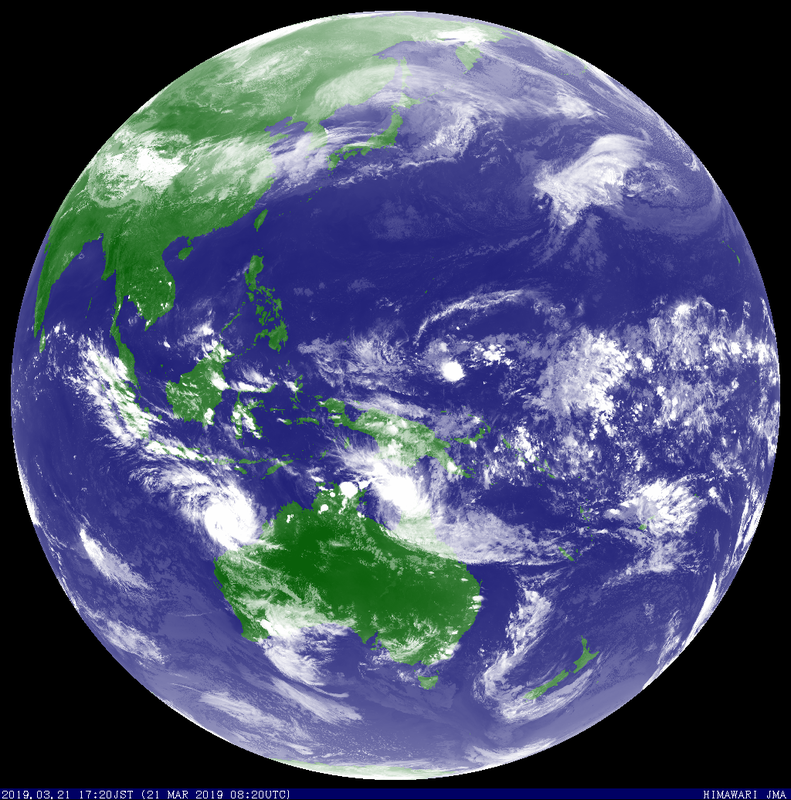 Veronica weakened as it moved South West along the coast over the 25 and 26 March 2019. Severe Tropical Cyclone Veronica is causing DESTRUCTIVE winds and heavy rainfall on the central Pilbara coast between Dampier and Port Hedland. Warning zone: Wallal to Mardie, including Port Hedland and Karratha, and adjacent inland areas, including Pannawonica. 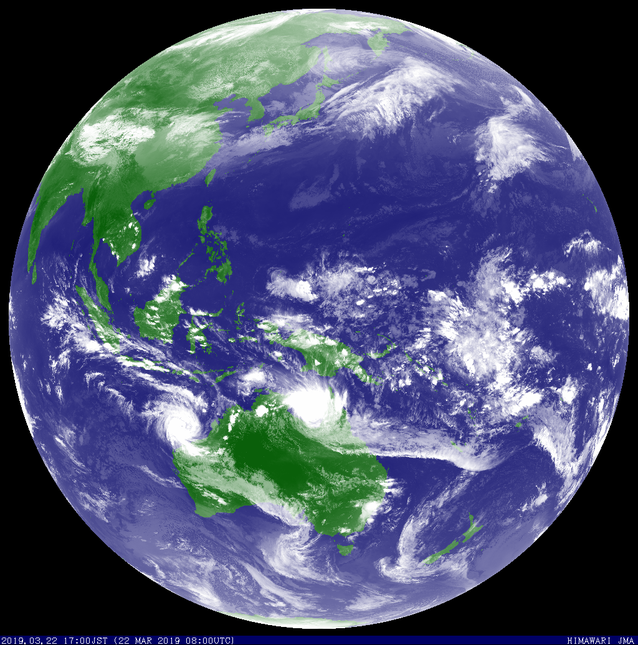 Intensity: category 3, sustained winds near the centre of 155 kilometres per hour with wind gusts to 220 kilometres per hour. Location: within 30 kilometres of 20.3 degrees South, 117.7 degrees East , 90 kilometres west of Port Hedland and 100 kilometres east northeast of Karratha. Movement: south southeast at 6 kilometres per hour . The cyclone's core has reached land and is over the coast just east of Roebourne and west of Port Hedland. The centre is forecast to remain near the coast today and tonight. Veronica is forecast weaken during Monday and start moving to the west. VERY DESTRUCTIVE WINDS with gusts in excess of 165 kilometres per hour are expected near the cyclone centre today and tonight. This includes Roebourne, Wickham and Point Samson. DESTRUCTIVE WINDS with gusts exceeding 125 kilometres per hour are occurring along the Pilbara coast between Dampier and Port Hedland and are forecast to extend to adjacent inland areas today with gusts to 100 kilometres per hour are expected between remaining parts between Mardie and Pardoo, and may extend to adjacent inland areas including Pannawonica later today. They may also extend east of Wallal Downs tonight if the system moves further east. The slow movement of the cyclone means that communities in the path of the cyclone should prepare to shelter from the destructive winds for an extended period today and into tomorrow. Widespread very heavy rainfall conducive to MAJOR FLOODING is likely over the Pilbara coast and adjacent inland areas today and Monday. Heavy rainfall is expected to result in significant river rises, areas of flooding and hazardous road conditions. Some roads may become impassable and some communities may become isolated. Flood Warnings and Watches are current, please refer to http://www.bom.gov.au/wa/warnings/ for further details. People along the Pilbara coast east of Wickham are warned of the potential for a VERY DANGEROUS STORM TIDE on the high tide today (high tide at 1pm at Port Hedland) and tonight (high tide at 1:30am Monday at Port Hedland). Tides are likely to rise significantly above the normal high tide mark with DAMAGING WAVES and VERY DANGEROUS COASTAL INUNDATION. Tides in remaining areas of the warning area are advised that tides will rise above the normal high tide with some flooding of low-lying coastal areas. 240300Z POSITION NEAR 20.2S 117.5E. 72. MAXIMUM SIGNIFICANT WAVE HEIGHT AT 240000Z IS 30 FEET. 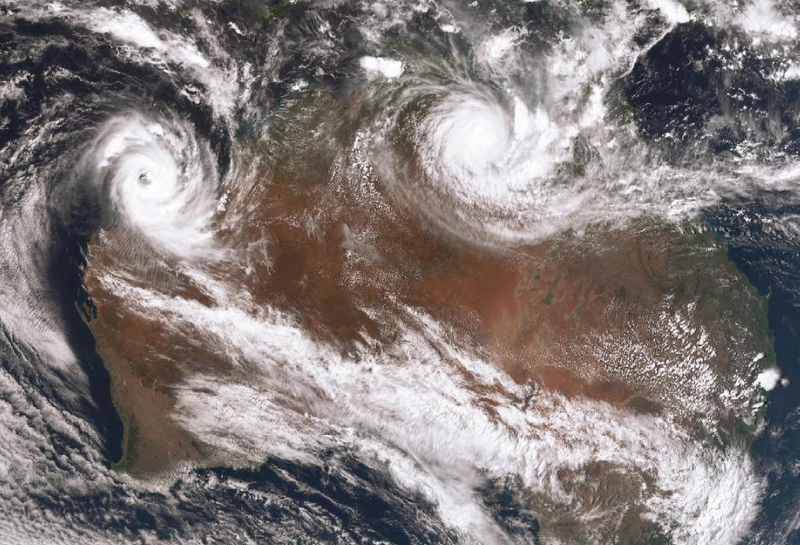 Satellite image of Tropical Cyclone Veronica (left) and Tropical Cyclone Trevor over Cape York Peninsular, 23 March 2019. from www.bom.gov.au. 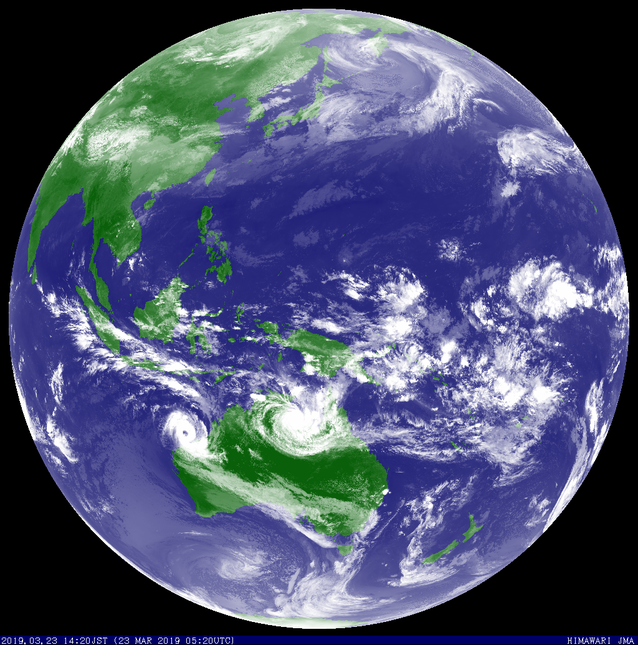 Infrared satellite image of Tropical Cyclone Veronica. From JTWC.